No matter what country your coin is from, all coins share similar characteristics. 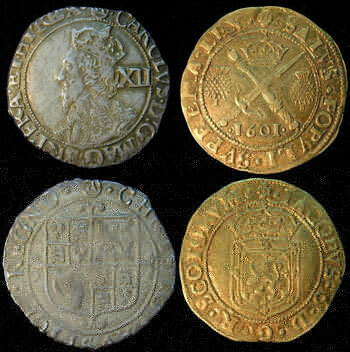 For example, all coins have “Heads” & “Tails” or Obverse & Reverse. Some coins have portraits on both sides, then the “Head” side would be the side with the date. If there is no date, the “Head” side is the side that shows the name of the country. Coins have a third side also, the “edge.” There are four basic edges: plain, ornate, reeded (like a current United States quarter or a dime), and lettered. Knowing what kind of edge your coin has can help you identify it. Plain edge coins have smooth edges. An example is the United States cent and nickel. In modern times plain edge coins are usually reserved for the lowest value denominations. In ancient times most coins had plain edges. Ornate edges have a repeating design that is pressed into the coin by the collar that holds the blank in place when a new coin is going to be made. Reeded edge coins are a nineteenth century invention, so if your coin has reeding on the edge it’s modern. Some coins have lettering impressed on a plain edge. This is used as an anti counterfeiting measure. The name of the country or minting authority is usually inscribed on coins. In countries that use the Latin-English Alphabet it’s easy to identify, though the name of the country might differ from the English spelling or pronunciation. Coins with square holes in the center with oriental inscriptions are called “Cash” and were made in China, Japan and Korea. Most date from the 15th century or before. They range from “U.S. quarter” size to the size of a saucer and can be worth less than a dollar to hundreds of dollars. The most difficult coins to identify are from countries that use other alphabets and language systems such as those of Arab, Indian or Persian countries. Symbols on these coins make it easier to at least identify the general geographical area. For example, coins from Tibet often feature a lotus blossom, coins from Nepal may feature a trident, and coins from Turkey often have an intricate monogram as a central design theme. Not everybody uses the same Calendar that we do, therefore the dates on coins may not be what they seem. For example the year 1992 is really the date 1413 in Moslem Countries, or the year 5752 in Israel or 2535 in Buddhist countries. One of the best general references about world coins from the 20th century is Standard Catalog of World Coins 1901-2000. For the 19th century, it’s the Standard Catalog of World Coins: 19th Century Edition 1801-1900. Why does the “Red Book” disagree with the “Black Book”? What Americans were on coins that were not presidents?